Q. Should I use my mixer's group outputs or its direct outs for recording? 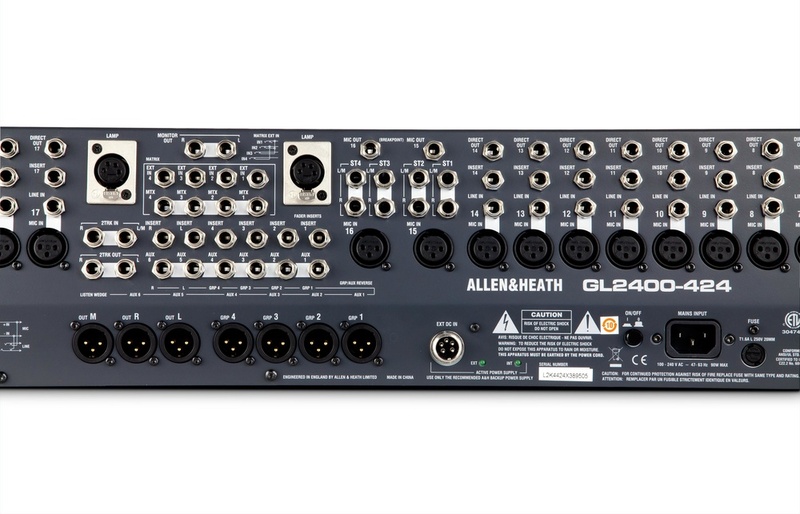 Like other mixers, this Allen Heath GL2400-424 offers both direct outs on channels and group outs. But which should be used and when? I recently started teaching music technology in a college and was asked to rebuild one of the studios. It uses a 32-channel mixing desk, patchbay and Alesis HD24 hard disk recorder to record to, as well as outboard gear. The desk has eight group busses arranged in four stereo pairs. There are 24 mono group output sockets, three per group buss, so that group 1 goes to outputs 1, 9 and 17, group 2 goes to 2, 10 and 18, and so on. The way it was set up previously was that these 24 group outputs were normalled through the patchbay to the 24 inputs on the HD24. The students were being taught that the signal should come into the desk and then be routed through the relevant group to get to the HD24. For instance, if your mic is plugged into channel 3 and you want to go to track 5, you have to route it to group 5-6, pan it hard left and bring up the channel fader and group fader. However, I changed it so that the direct outs of the first 24 channels are normalled through to the 24 inputs of the HD24, which seems to make more sense. One of the lecturers is kicking up a fuss, so my question is: which practice is most common in professional studios? Reviews Editor Mike Senior replies: You're both right after a fashion, but I'm afraid that I think the lecturer is probably more right in this case, as you appear to be using a group desk, rather than an in-line one. Your approach has two main limitations. Firstly, you can only route channel 1 on the desk to channel 1 on the recorder. This is admittedly less of a limitation with a digital recorder, where you can swap tracks digitally, but it's still quicker to do this from the desk than from the recorder. The second (and more serious) limitation is that you can't record a mix of several channels to the same track on the recorder. Although 24 tracks is quite a lot to work with, you might need to submix a number of microphones to, say, a stereo pair of tracks — for example, when layering up a string quartet a few times to make a composite string sound for a pop production. Another problem is that you can't use the mixer's EQ on the way to the recorder, as direct outputs are often taken from before the EQ circuitry. Also, you couldn't bounce down a group of tracks through the desk in this way without sending them all to a group first, and then patching from the group output to a further channel. So you'll have more flexibility if you do things the lecturer's way. One reason that you're not completely wrong is that you're implementing a kind of in-line methodology, treating the input stage up to the direct output as the input path and the rest of the channel as the monitor path. However, a group desk isn't really sufficiently well equipped to do this properly, most notably because there is no routing matrix between the input channels and the recorder inputs, as there would be on an SSL desk or similar. There's only one routing matrix per channel on a group desk, and that is situated after the channel fader. There's no real alternative, given the facilities, but to have separate channels for the input and monitor paths. In your case, as you have only 32 mixer channels, this means repatching for mixdown and monitoring purposes, I imagine, but I don't know all the details of your setup. One situation where you can get away with using an in-line configuration on a group desk, exactly as you have, is where the recorder is actually a computer system. In this case, given the powerful processing facilities a computer offers, there's little advantage these days in pre-processing audio before it reaches the computer, so the lack of input EQ would not really be a problem. Also, there are comprehensive input routing and mixing facilities built into most modern audio-recording packages, so a hardware routing matrix would also be unnecessary. Perhaps you could justify your routing scheme as just being a little ahead of its time? You are simply anticipating the happy day when the college moves to a more flexible computerised system! At the end of the day, which is the more appropriate arrangement depends on how many tracks you plan to record at one time. The group routing approach is more flexible when it comes to being able to do track bounces and partial submixes, and it is an important way of working to teach students. However, the down side is that you can record no more than eight (different) tracks at a time because there are only eight groups on your mixer. Taking the direct outs approach allows up to 24 different tracks to be recorded at the same time and is ideal in areas designed purely for tracking, but you are then in for lots of replugging when it's time to mix. In any case, students should definitely be made aware of both techniques and configurations. One possible solution that you could consider is using the patchbay to normal the group outputs to the recorder inputs, as before, but also send all of the desk's direct outs to patchbays on the row above, so that when you need to patch direct outs straight into recorder tracks it's just a case of plugging in some patch cords.